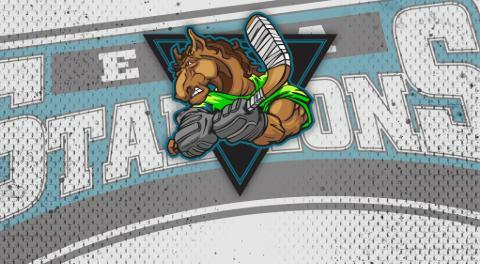 The Essa Stallions sit atop the CPJHL standings, although dropping 2 of the last 3 (one in OT). However, there is no time to sit and feel sorry for themselves, as the Stallions hit the road tomorrow night for the 1st of 3 games this weekend as they travel to Scarborough to take on the Wexford Raiders. The previous meeting was a spirited affair, which saw some rough play and some after the whistle gatherings. That could have been attested to the physicality of both teams, or the score; 13-1. Nonetheless, the Stallions are expecting a much different game from the Raiders this go-round. "We don't put too much stake into the first game. They didn't play well, neither did we regardless of the score. All of the games we have played are in the past. Take the good things forward, throw out the bad. We have a big home & home with them (Friday & Saturday night) this weekend, where 4 pts are on the line. We've had a good week of practice, juggled some lines for the upcoming weekend. Hopefully the boys are focused and ready to work" Said General Manager & Assistant Coach David Lang. Saturday night will see the Stallions Host the Raiders at The Angus Recreation Centre, 7:30 p.m. Puck Drop! Sunday, will involve another road trip for the Stallions, as they head down Highway 10 to Brampton, to take on the expansion franchise, The Brampton Royals. At the time of this article, The Royals currently sit in 8th place with a record of 1-4. "Playing new teams is always a challenge no matter what league you're in. Video can only show so much. We'll prepare like we always do. Go in, play hard, hopefully get two points" said Head Coach and Director of Hockey Operations Sylvain Cloutier. Saturday, October 20th vs Wexford Raiders 7:30 p.m Puck Drop @ Angus Rec Centre "The Barn"